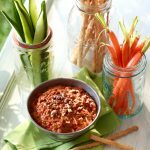 Carrots are a great item to have on hand and one of the few ingredients that are equally as at home in a main meal as they are on the breakfast table or baked into a decadent dessert. 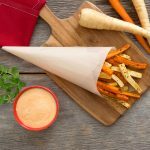 Whether it’s to top a salad, add some crunch to a stir-fry, roast for a side dish, or blend into a hearty soup, Carrots add a lovely flavour to a variety of dishes. When blended with apples, they are an excellent base for fresh juices – enjoy this combination on its own, or add in your choice of greens. 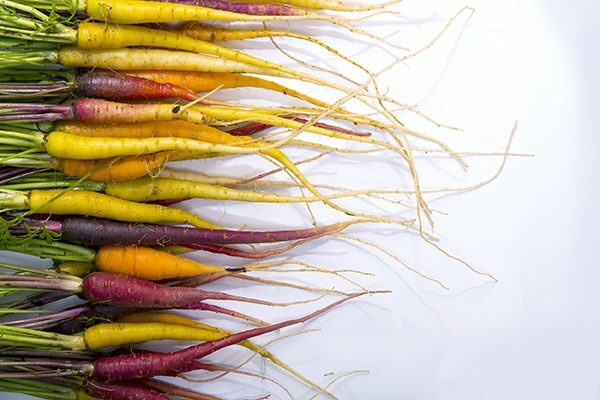 Carrots can be orange, white, yellow, red, purple or black. While they all taste similar, each variety does have a subtle difference in flavour. Fresh carrots should have a deep colour with no signs of spoilage. They should always be firm and never cracked. 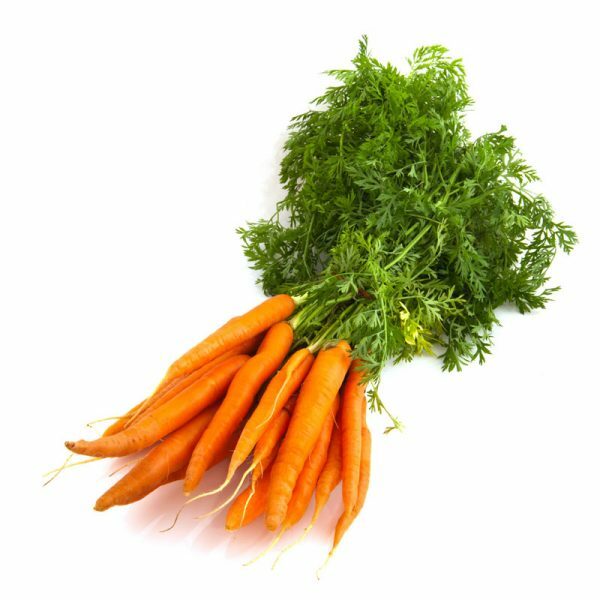 Avoid purchasing carrots that are green in colour, as these ones tend to be bitter. Also avoid any that are limp or black near the top. Choose medium sized carrots that taper at the ends. Larger and thicker carrots may be woodier and tougher to eat. Smaller ones may be more tender, but are not as sweet as medium-sized carrots. It’s best to store your carrots in an open or perforated plastic bag in the refrigerator where they can last for up to two weeks. You can eat the tops of carrots! Green carrot tops add great flavour to soups and stocks. However, remove the tops from the carrots before storing them in the fridge, as they will not last as long as the carrot root itself. Tops may also wick moisture away from the carrots. To freeze carrots: peel and chop into bite sized pieces. Blanch in hot water with a pinch of salt for 3 minutes. Drain and submerge into an ice bath for 30 seconds to halt the cooking process. Drain and arrange in a single layer on a baking sheet to flash freeze. Transfer frozen carrots to an airtight bag or container and use within a year. Mature carrots should be washed and peeled. Younger carrots have a thin and tender skin and only need to be washed – a vegetable scrubber is great at getting all the dirt off. 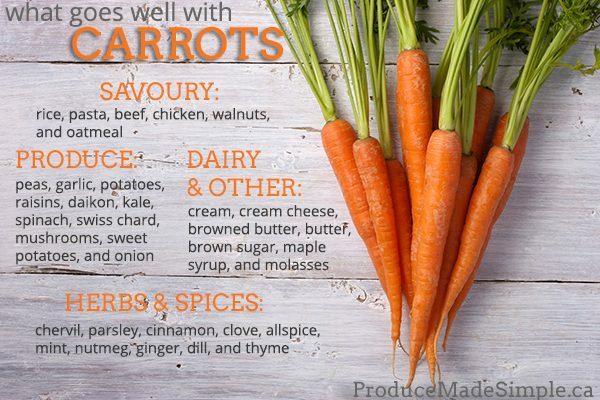 Carrots are very versatile and can be grated, peeled, sliced and diced to be enjoyed raw or cooked. When cooking carrots be sure to remember that the smaller the carrot is cut, the faster it will cook. 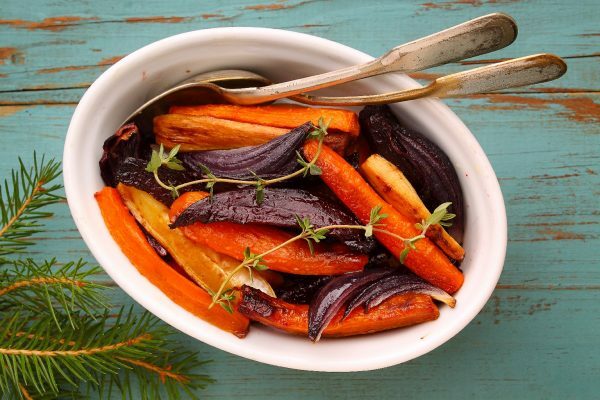 When cooking carrots with other ingredients by roasting, baking, or boiling, keep in mind that as a hard vegetable, carrots may take longer to cook and should be cooked or baked prior to adding softer ingredients that cook for less time. Cooking methods include: boiling, steaming, microwaving, roasting, grilling, simmering, baking, stir-frying and braising. You can tell they are done when they are tender but not soft and mushy. Tasting your carrots as they cook is the best way to decide when they are done. How to Bake: Cut carrots into 1 inch diagonal slices. Arrange in a shallow layer in a baking dish; generously dot with butter, margarine, or oil. Cover and bake in a 325ºF (160ºC) oven until tender when pierced (40 to 50 minutes). Turn over several times. How to Boil: In a wide frying pan, boil 1 pound of whole carrots, covered in 1 inch of water until tender when pierced (10 to 20 minutes). Drain and serve. How to Microwave: Arrange 1 pound whole regular carrots or sliced carrots in a 1½ baking dish. Add 3 tablespoons of water; cover. Microwave on high- whole carrots for 6 to 7 minutes, slices for 5 to 6 minutes. Stir after 3 minutes. Let stand, covered, for 5 minutes. Carrots should be tender when pierced. How to Steam: Arrange slices or whole or miniature carrots on a rack. Steam until tender when pierced (5 to 10 minutes for slices, 12 to 20 minutes for whole regular carrots, 8 to 12 minutes for whole miniature carrots). How to Stir-fry: Cut carrots into ¼ inch thick slices. Stir-fry up to 5 cups in 1 tablespoon of oil for 1 minute. Add 3 tablespoons of liquid, cover, and cook until tender crisp to bite (3 to 5 more minutes). Use carrots in juices. They taste great with a little apple and ginger, which add sweetness and zing. Try adding grated carrots to your favourite salad for some additional crunch, and colour. Grate carrots into spaghetti sauce, add them to meatloaf or tomato soup for some extra flavour and fibre. It adds an element of sweetness and most people don’t even notice it’s there. All great stocks start with a sweet and savory base that includes carrots. Whether it’s chicken stock, fish stock, or even vegetable stock, adding carrots (and onions) will add a great and essential dimension of flavour. 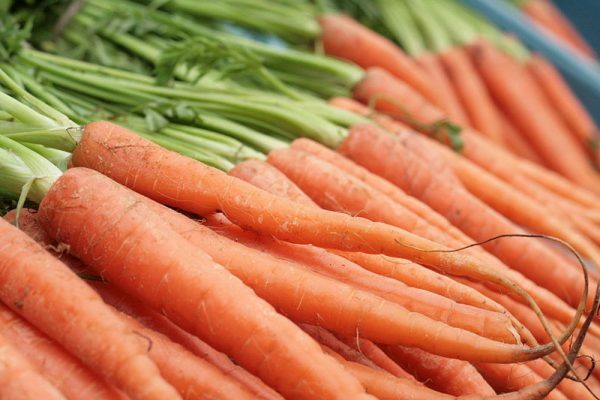 Fun fact: Did you know that the range of growth for a carrot is from 2 inches to 3 feet long?! Carrot sticks make great and fast snacks. Cut into strips and use to scoop up veggie dips like dip, hummus or baba ganoush. Cooked carrots make an excellent vegetable side dish, and they are often served with cream sauce, glazed, or dressed with a little brown sugar and butter. Carrot tops are rich in minerals, and can be chopped and added to soups, salads and sauces. 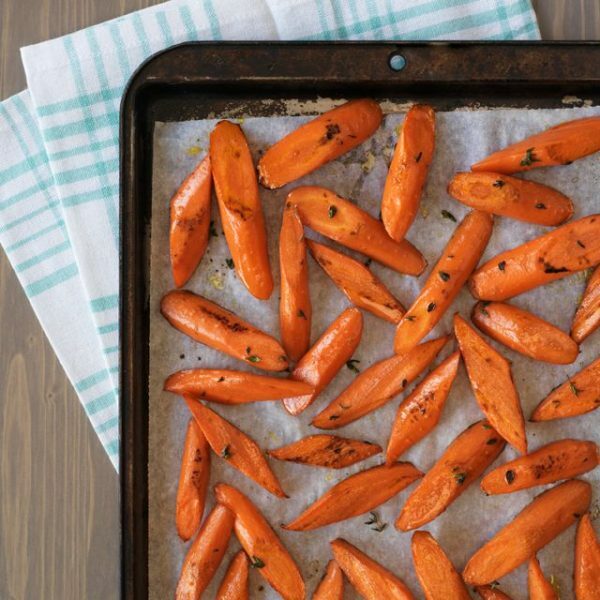 Try making oven roasted parsnips and carrots for a tasty side dish or a snack! Dip in some garlic sriracha mayo as a delicious after school or after work snack that’s tasty and good for you. Vitamin A, fibre, vitamin C…what’s not to love? 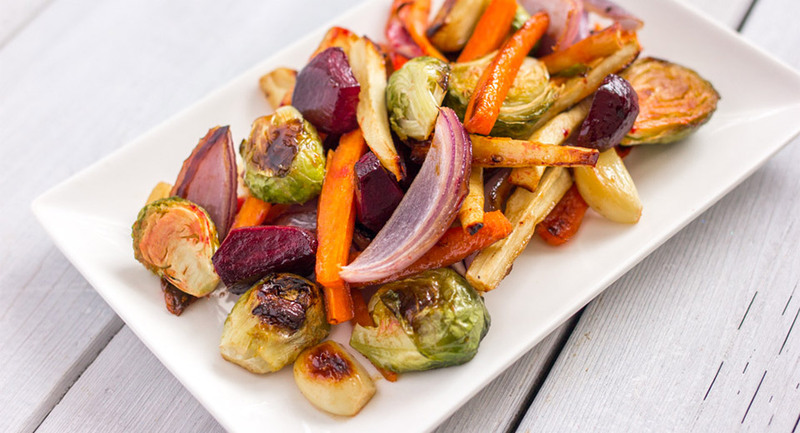 Serve a sweet side dish like these roasted carrots with clover honey with a holiday meal for an extra special take on an otherwise classic dinner dish. 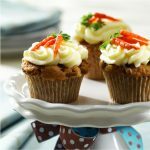 Satisfy everyone’s sweet tooth with delightful, delicious carrot cupcakes your whole family will love. These moist cupcakes can be enjoyed unfrosted for breakfast on the run or a lunch-box treat. 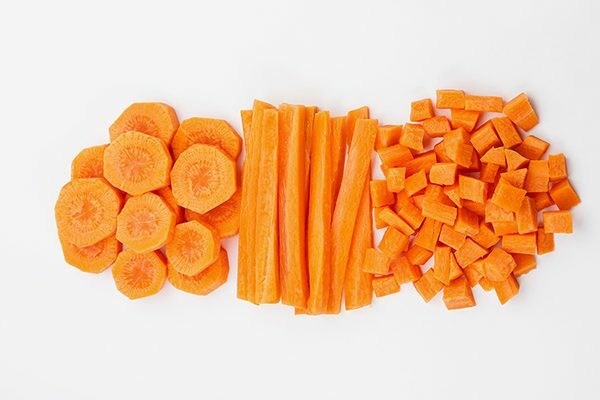 According to the Canadian Nutrient File, 100 g of raw carrots contain a great number of your daily-recommended intake of nutrients: over 130% of Vitamin A, 17% of Vitamin K, 10% of Vitamin C, 10% of fibre (2.4 g), 9% of potassium, 8% of folate, 5% of magnesium, and 256 µg of the antioxidant lutein and zeaxanthin.